I'm not an alcoholic by any means, but I love having a cocktail or two (or maybe three) whenever I go out with friends, and I admit that I also like having them at home. After a long day of dealing with the kids, I may even enjoy a glass of wine and sometimes I enjoy it "just because". After all it's 5'o'clock somewhere right? 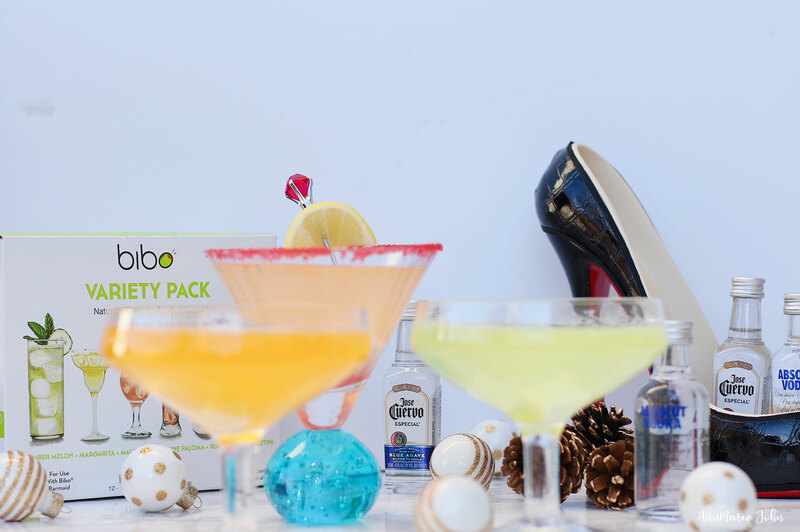 Today in partnership with Bibo Barmaid, I want to share how you can host a great cocktail party and have a perfect cocktail every single time! This post is done in collaboration with Bibo Barmaid, and is intended for those 21 and older, however all opinions are mine alone. Who doesn't appreciate a great cocktail party? It's a time to get together with friends and enjoy fabulous drinks, delectable snacks and share in the laughs and gossip with friends. 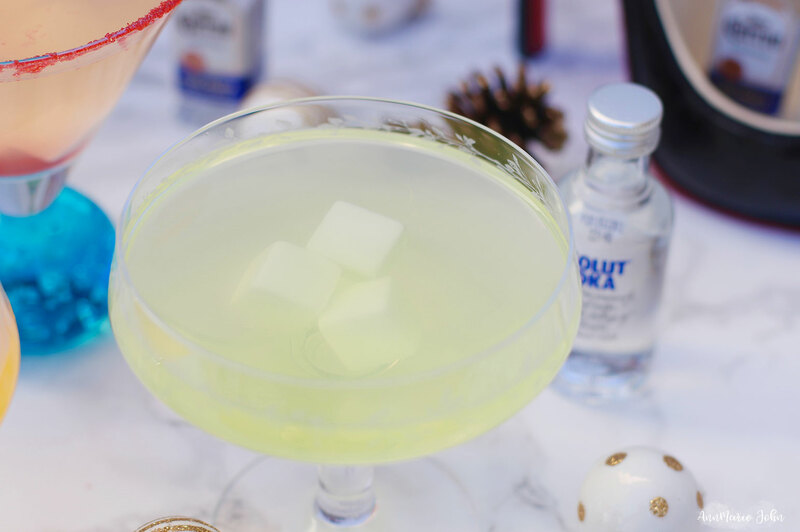 Cocktail parties are generally low budget since you don't have to prepare big meals, but there is more to hosting a cocktail party than just booze. Whether it's big or small, there are a few things needed to make it the best it can be. It's all about the drinks! What's a cocktail party without the drinks? It's not even considered a party! However, unless you're prepared to hire a bartender, how do you make that perfect cocktail each and every single time? That's where the Bibo Barmaid comes in. 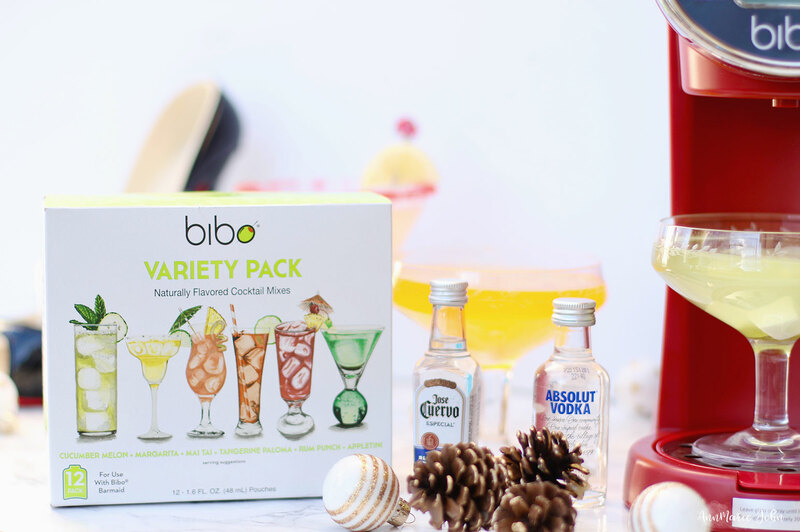 The Bibo Barmaid is like having your very own bartender, and takes the guesswork out of making cocktails. Each machine comes with everything you need, except for the alcohol, which you will have to provide yourself (rum, vodka or tequila). However, it couldn't be easier to operate. The instructions are simple! Simply insert your mixer pouch, and with a push of a button you have a perfect drink whenever you need it within 20 seconds. It even advises on what garnish is perfect for your drink, so that you look like a professional without being one. Take a look at the video below and see how easy it is! It's also about the appetizers! There's nothing worse than drinking alcohol on an empty stomach. Trust me I know! Finger foods are perfect for cocktail parties, so make sure there are lots of appetizers available for guest. You can either make the appetizers or purchase pre-made appetizers from a local eatery or even your favorite warehouse store. Be sure to label your foods so that your guests know what they're eating in the event of allergies to certain foods. Have a mixture of music. Ask your guests about their music preference and play a variety so you're not playing the same thing over and over again. You can even invite guests to give you a playlist, that way you have a few choices that you can add to your own. Even though you're ditching the china, have some fancy paper plates and napkins on hand. Don't go the cheap route. You don't want to have a mess on your nice carpet or couch because you were too cheap to get the good stuff. Make sure you have enough napkins and place them near the appetizers so guest can have easy access to them. For your cocktails, you want to really show up those drinks that you make in your Bibo Barmaid with some fancy schmancy glassware. Currently, you can make Appletini, Cucumber Melon, Malibu Mai Tai, Rum Punch, Tangerine Paloma and Margarita's so have glassware to complement these drinks. Since drinks are made individually, you're going to want to keep the reservoir filled to satisfy each guests' taste. You're the host, and while it's your job to make sure that everyone is having a great time, everything is in it's place and you're not running out of anything, you should also take the time to mingle with your guest and make sure that they feel welcome. 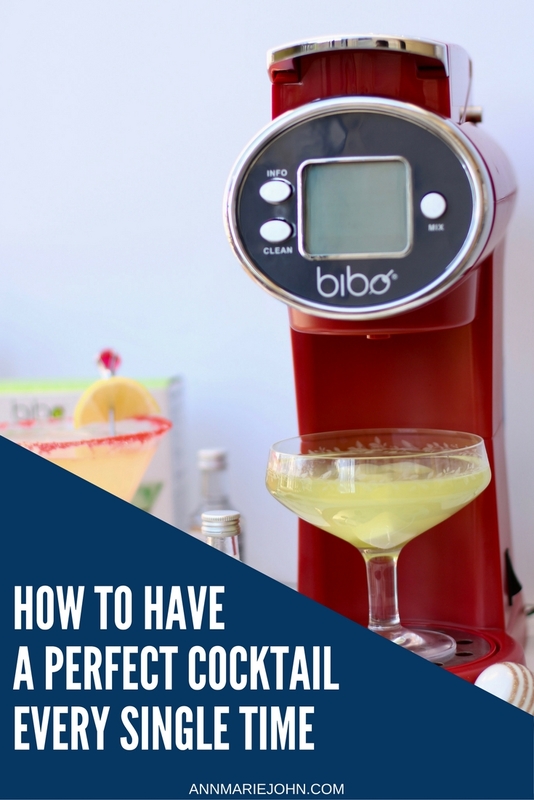 After all, you want to have the best cocktail party ever, and be the talk of the town with your Bibo Barmaid cocktail machine. 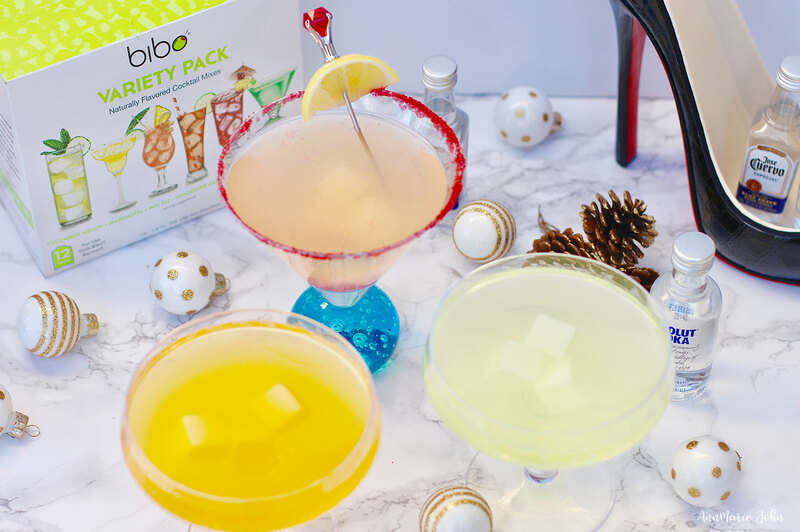 So throw the most amazing cocktail party ever and let Bibo Barmaid help you be the life of the party! Remember drink responsibly! 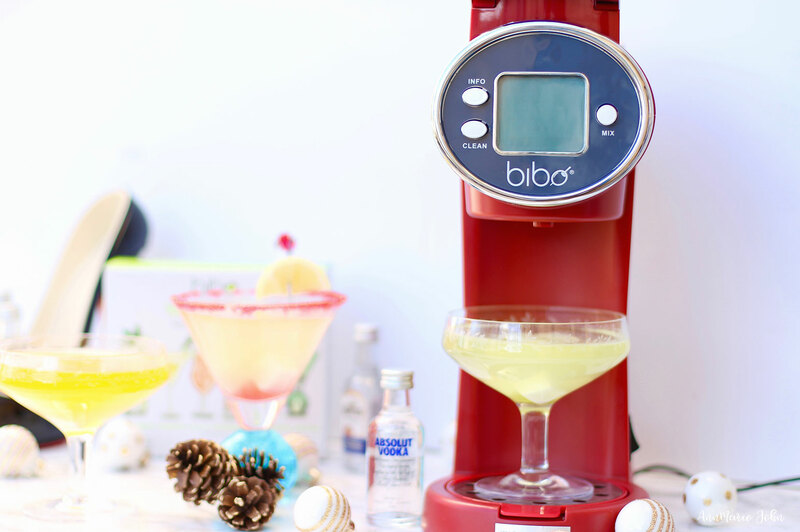 What drink will you create with your Bibo Barmaid? It's the Holiday Season and I have a surprise for you! One lucky winner will have the chance to win a Bibo Barmaid right here on AnnMarie John. It's perfect for those holiday parties that you have planned later this month. Winner will be randomly selected and will have 48hrs to respond. Failure to do so will mean forfeiting your prize and a new winner will be chose. Good luck! That's exactly genius. Totally! I don't drink but I throw parties like the best of them. OMG, this looks life the perfect gift or just the perfect thing for the house! making cocktails is always so much fun! Would love to make a cosmo with this! I don't drink much but I have a friend that would love this! Thanks for sharing this! I am looking forward to making a Mojito. This Vibo Variety Pack looks so good! I would like to host my own cocktail party soon! That Bibo Barmaid looks amazing, totally perfect for a cocktail party. Though I need to steer clear of alcoholic beverages for now. I would love to try to host a cocktail party! Great tips! ohhh I haven't heard of Bibo! It definitely looks like I need to get acquainted for the upcoming holidays! I can't believe how cheap this retails for. It reminds me of the little bar I'd like to create outside in our patio. Definitely looking into the bibo barmaid for my husband. Who knows, might get it for Christmas or Father's Day. I want one!!!! (Laughing) I love cold drinks and this would be the center of my entertainment tool kit. LOL. I am not sure whether to be excited or scared by this kind of a bar tending machine. It does sound kind of cool though. I wonder how it calculates and mixes everything. This is an amazing product. I would be so excited to use it! I entered the raffle.Hope I win! I'd love to make a Mojito. I am looking forward to making a Whiskey Sour. Oh this sounds cool. D would love something like this! !